Moving a loved one with dementia from their home of many years into assisted living or a long-term care facility, may be one of the most difficult decisions you ever have to make. Once the person is settled into their new residence, you may feel a sense of relief now that you have other people to help care for your loved one. After the initial move, the transition from home to long-term care can be challenging for both your loved one as well as other family members. Who do you speak to when you have a concern? Likewise, who do you thank when your loved one seems happy and content? How do you navigate what can be a complex and confusing system? Strong communication skills will help you get the information that you need, and if necessary, advocate for your family member. Don’t be afraid to speak up or to ask questions. 1. Ask to be introduced to the staff and find out what each person’s role is. Who is hands-on within the unit and who are the leaders? Introduce yourself and let them know your relationship to the person they are caring for, and how often you plan to visit. 2. Ask if they have a welcome package for family members to help you become acquainted with the facility and any rules they may have. Take it home and set it aside for a few days. Give yourself time to adjust to the changes, and permission to feel whatever emotions you may have at this time. 3. Let the team know how you prefer to communicate regarding any updates pertaining to your loved one. Do you want to receive telephone calls, emails or text messages? Or do you prefer to receive information in person? Likewise, how do they wish to be communicated with when you have a question? Can you phone, and if so, who do you speak with? The facility may have a communication protocol so find out what you can expect if there is an incident, or your loved one has an accident or fall. 4. Buy a notebook to keep track of questions you have, important information, names of staff, etc. It will help you to stay organized if you keep everything in one place. 5. Find out who the doctor is and arrange for a meeting. Begin to develop a relationship before a medical crisis takes place. Express any concerns you may have about the health of your loved one. Get an up-to-date list of the medications they are on. 6. Attend any scheduled care conferences with the team. The team may include the doctor, nurse, nursing assistants, dietitian, social worker, recreation therapist, and client advocate. These meetings can be one of the few times, within a year, when you will have the opportunity to ask questions of the various team members and hear different opinions regarding decisions that may affect your loved one. 7. Ask for details if there any reports of issues or difficulties in caring for your loved one. Offer any possible solutions to the problem and look for patterns in the person’s behavior. 8. If possible, include your loved one in decisions that affect them. Let them express their desires and wishes if they can. If they can no longer communicate using language, look for body language and non-verbal clues. 9. Update the team if you have a new phone number or e-mail address. 10. Compliment the staff and thank them on a regular basis. Their jobs are not easy, and it takes special people to provide the tender loving care that you want for your loved one. The important point to remember is that you are an important member of the team. Do your best to help the other team members get to know your loved one. 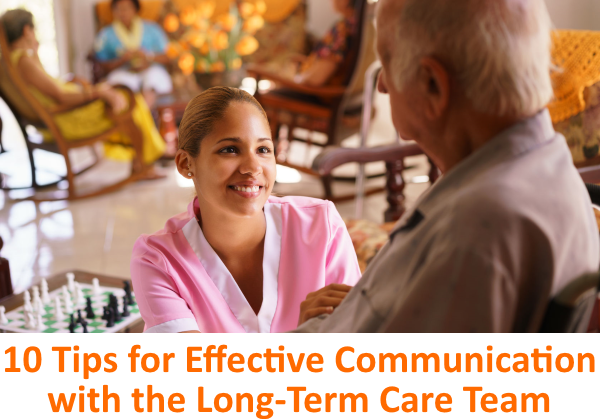 Be sure to keep the lines of communication open so that the person receives the best care possible, and so any bumps along the way can be resolved quickly. 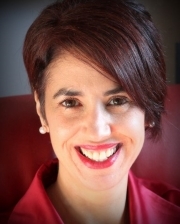 About the Author: Rosanne Burke is a professional speaker, educator, and owner of Keji Consulting, a dementia education and training business. Rosanne facilitates group workshops, and offers individualized coaching sessions for families and healthcare professionals. She is passionate about improving the care, and quality of life for persons living with dementia, and their care partners. She is a care partner to her father and an active volunteer with the Alzheimer Society of Nova Scotia. Rosanne can be reached by email at rosanne@kejiconsulting.ca, on Facebook at Facebook.com/KejiConsulting and on LinkedIn at Linkedin.com/in/rosanneburke. These are great suggestions, Rosanne. I also encourage family members not to be afraid to speak up if they have a question or concern. The staff at the nursing home can’t fix a problem if they don’t know about it. Also, please bring up a concern right away before a molehill turns into a mountain. Thanks for your comments Diane. Absolutely! It’s so important to speak up in the best interests of your loved one. I like your point that they can’t fix a problem if they don’t know about it!